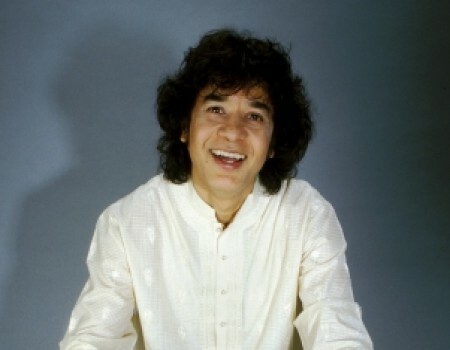 Zakir Hussain is considered one of the greatest musicians of our time. Along with his legendary father and teacher, Ustad Allarakha, he has elevated the status of his instrument, the tabla, both in India and around the world. A favorite accompanist for India’s leading classical musicians and dancers, Zakir is also widely recognized as a chief architect of the world music movement with his many historic collaborations, including Shakti, Remember Shakti, Diga, Planet Drum and his ever-changing musical feast, Masters of Percussion. In Summer 2012, Zakir was named Best Percussionist in the Downbeat Critics’ Poll. Read More... A child prodigy, Zakir began touring at the age of twelve, becoming the most acclaimed Indian musician of his generation and one of the world’s leading percussionists. He is the recipient of many honors, including a recent Grammy in the Best Contemporary World Music category for Global Drum Project with Mickey Hart, Giovanni Hidalgo and Sikiru Adepoju, Padma Bhushan from the government of India in 2002, and the 1999 National Heritage Fellowship, the United States’ most prestigious honor for a master in traditional arts. In 1992, Planet Drum, an album co-created and co-produced by Zakir, became the first recording to win a Grammy in the Best World Music category and also won the Downbeat Critics’ Poll for Best World Beat Album. Both Modern Drummer and Drum! magazines named him Best World Music Drummer and Best World Beat Percussionist, respectively, in 2007. In April, 2009, his music was showcased for four sold-out nights at Carnegie Hall’s Artist Perspective Series. Also in 2009, Zakir was named an Officer in the Order of Arts and Letters by France’s Ministry of Culture and Communication. In March 2011 the National Symphony Orchestra commissioned and presented his Concerto for Four Soloists at the Kennedy Center conducted by Christoph Eschenbach. He has contributed to innumerable recordings and has received widespread recognition as a composer for his many projects, scores and soundtracks including Little Buddha, In Custody, Vanaprastham, Mystic Masseur, Mr & Mrs. Iyer, YoYo Ma’s Silk Road Project and the acclaimed Concerto for Banjo, Bass and Tabla commissioned by the Nashville Symphony for their center’s opening gala in 2006 and co-composed with his constant colleagues, Edgar Meyer and Béla Fleck. In March, 2013, SF Jazz in San Francisco presented four nights featuring Zakir Hussain in different musical collaborations for their much-anticipated new center’s inaugural season. In Summer 2013 Zakir embarked on an extensive tour of South America with legendary Jazz pianist Herbie Hancock. Zakir will be bringing his Masters of Percussion back to the US in Spring 2014, including a performance at the world-famous Madison Square Garden.